The bright side of starting a new club was a blank slate to foster core philosophies. That included coaching athletes at their own pace and to suit their personalities, teaching life skills like manners, time management and independence, and providing an inclusive atmosphere for all athletes regardless of any disabilities or personal challenges they may face, thanks to skilled, bilingual coaching. “It really is more of a family than a team,” underlines athleteturned-club head coach Brennan Villemaire, Murphy’s son. “The kids support each other. Our older athletes take the time to help out the little kids who might be struggling with one thing. It’s really close-knit.” The Ottawa National Diving Club took root in 2007 with all of 2 members. 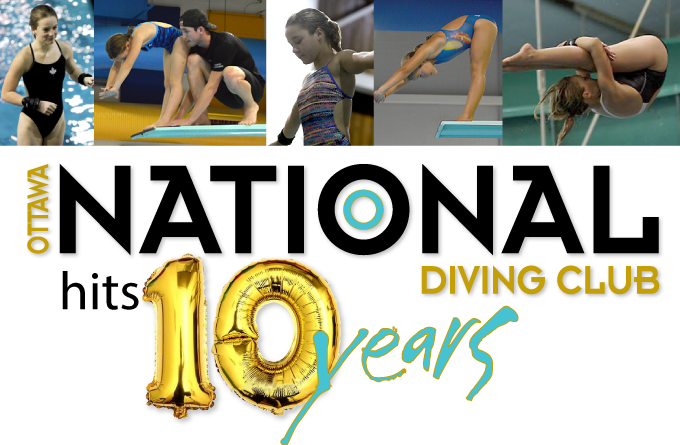 Ten years later, the club operates at 4 pools, with over 250 in its learn-to-dive program, plus more in its competitive ranks, including 8 national-level athletes. It is home to provincial outstanding divers and record holders, national champions, Team Canada members and international medallists. At the recent Dive Ontario awards banquet, ONDC scored the most diver of the year honours (across different age groups/levels) out of all clubs in the province. “I wanted them to know everything she does for our club and our sport,” Villemaire explains. “How many hats she wears on a daily basis, how much time she’s dedicated, how she’s gone above and beyond for every single athlete in this club.” Murphy’s volunteerism has become infectious throughout ONDC, with many helping to fundraise, give their time, serve on the board of directors, and do whatever else is necessary for the club to thrive.